How do you know whether something is true? How do you convince others to believe the facts? Research shows that the human mind is prone to making thinking errors - predictable mistakes that cause us to believe comfortable lies over inconvenient truths. These errors leave us vulnerable to making decisions based on false beliefs, leading to disastrous consequences for our business, personal lives, relationships, and civic engagement. Fortunately, cognitive and behavioral scientists have uncovered many useful strategies for overcoming our mental flaws. This book presents a variety of research-based tools for ensuring that our beliefs are aligned with reality. With examples from daily life and an engaging style, the book will provide you with the skills to avoid thinking errors and help others to do so, preventing disasters and facilitating success for yourself, those you care about, your organization, and our society. 3. Audio version: $17.50 on Amazon. 4. All common e-book formats (EPUB, MOBI, AZW3) as well as a PDF file: $5.50 on Sellfy. 5. Best value: all common e-book formats (EPUB, MOBI, AZW3), a PDF file, and two training videos to empower you to help others avoid thinking errors (one video for doing so in professional activities and one in your civic and community engagement): $9.99 at Sellfy. 6. For discounts on bulk purchases (10 or more copies) of digital or print books for your organization, email us. 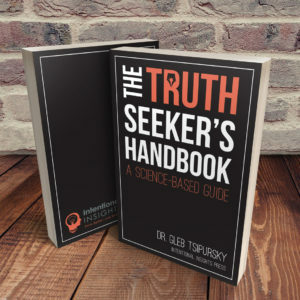 Known as the Disaster Avoidance Expert, Dr. Gleb Tsipursky has over 20 years of experience empowering professionals and organizations to address potential threats, maximize unexpected opportunities, and resolve persistent personnel problems. The author of the national bestseller on avoiding disasters, The Truth Seeker’s Handbook: A Science-Based Guide, Gleb also published over 400 articles and was featured in over 350 interviews, including in Fast Company, CBS News, Time, Scientific American, Psychology Today, The Conversation, Business Insider, Government Executive, Inc. Magazine, and many other venues. 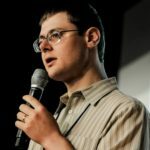 Gleb’s expertise comes from over 20 years of consulting and coaching for businesses and nonprofits, and he serves as the CEO of the boutique consulting firm Disaster Avoidance Experts, which uses a proprietary methodology based on cutting-edge research to help clients maximize their bottom line. Gleb’s clients include Aflac, Balance Employment Assistance Provider, Edison Welding Institute, Fifth Third Bank, Honda, IBM, International Coaches Federation, Ohio Hospitals Association, National Association of Women Business Owners, The Society for Human Resource Management, The Columbus Foundation, Vistage, and over a hundred others. He also has a strong research and teaching background in behavioral science with over 15 years in academia, including 7 years as a professor at the Ohio State University and before that a Fellow at the University of North Carolina-Chapel Hill. His dozens of peer-reviewed academic publications include journals such as Behavior and Social Issues, Journal of Social and Political Psychology, and International Journal of Existential Psychology and Psychotherapy. His civic service includes over 4 years as the Chair of the Board of Directors of Intentional Insights, an educational nonprofit advocating for research-based decision-making in all life areas, as well as service on the Advisory Board of Canonical Debate Lab and Planet Purpose, and the Editorial Board of the peer-reviewed journal Behavior and Social Issues. The leading expert on avoiding business disasters, Gleb has over two decades of professional speaking experience across three continents. He gets top marks from audiences for his highly interactive speaking style and the way he thoroughly customizes speeches for diverse audiences, while meeting planners describe Gleb as “a snap to work with.” Drawing on best practices in adult learning, Gleb’s programs address the wide spectrum of diverse learning styles, as attested by enthusiastic client testimonials and references. You can see his speaking style in his speaking videos, learn more about frequently requested programs, get information targeted at meeting planners, and check out his Speaker One Sheet for more information on his speaking. The book hit the Amazon bestseller list as #1 book in its primary category of "education in decision-making and problem-solving" shortly after its release in November 2017.